Perennial herb from a fibrous root; stems woolly, few- to much- branched from the base, 10-60 cm tall. Basal leaves few, soon deciduous; stem leaves alternate to opposite, entire to narrowly lobed, 1-8 cm long. 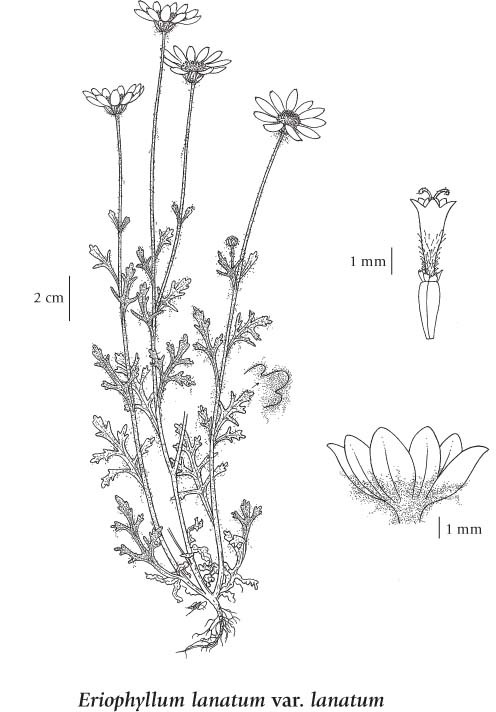 Heads with ray and disk flowers, solitary on long stems; ray flowers 8-13, yellow, 1-2 cm long; involucres 9-12 mm tall; involucral bracts firm, erect, embracing the ray achenes. Achenes slender, 4-angled, glabrous to hairy; pappus of 6-12 translucent scales, or a toothed crown. Dry meadows and rocky slopes from the lowland to the montane zones; common on Vancouver Island and the adjacent mainland, rare in SC and SE BC; S to MT, WY, UT and CA. A very shade-intolerant, submontane to montane, Western North American forb distributed equally in the Pacific and Cordilleran regions. Occurs in cool temperate and cool mesothermal climates on excessively dry to very dry, nitrogen-medium soils. Its occurrence increases with increasing precipitation and elevation. Grows in non-forested, grassy communities very shallow, on water-shedding sites; often inhabits disturbed sites. Characteristic of moisture-deficient sites.